Being some 250 miles away from Alderley Edge, DCC members have not spent much time in this area. The recent NAMHO conference (2007) prompted this page to be written. In no way is the DCC an authority on the area and there are several far more knowledgeable clubs working in the area such as Devon Mining Club, Tamar Mining Group, Carn Brea Mining Society, Plymouth Caving Group and Trevithick Society, to name just a few. A good point of reference for anyone interested in visiting the area is the NAMHO handbook (copies in DCC library). If anyone with better knowledge can suggest corrections to this page, the webmaster would appreciate the help. 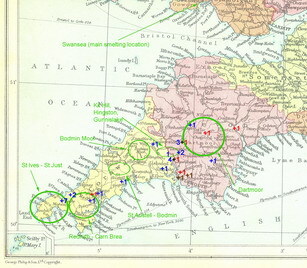 Even though Devon and Cornwall may not have been visited much by the DCC members, thee are strong links between Alderley Edge and the area as the map below shows: the numbers represent the number of miners (blue), managers or agents (red) and carpenters (brown) from the region working at Alderley Edge in the 1860s and 1870s. The south-west, formed of Devon and Cornwall, is such a large area that the description that follows will hardly scratch the surface. The area can be divided most conveniently by mineral with copper and tin being the most significant. Other minerals won include manganese, tungsten, iron, arsenic, lead, silver, zinc, nickel, cobalt, bismuth, antimony and uranium. Sulphuric acid was also made from the pyrite ores. The distinction between the counties is important to the people who live there but the geology pays little heed to this. Most ores in the area are related to granite intrusions and the main ones were St Just - St Ives - Lands End; Carnmenellis south of Redruth - Camborne; between Bodmin and St Austell; Bodmin Moor; Kit Hill - Gunnislake; and, of course, Dartmoor. The rest of the area is made of a variety of rocks from all periods with the Devonian predominating. The granite intrusions provided the source for the ores which tended to be deposited in rings (metamorphic aureoles) around the granite. In simplest terms, the tin and copper were deposited nearest to the granite and the lead and silver further away. As a general rule, tin is usually shallower in the lode and copper deeper so that many mines were worked first for tin and then for copper. For more information on the geology, refer to the British Regional Geology volume 17 or look at the smaller, cheaper and more readable accounts such as Peter Stanier's "Cornwall's Geological Heritage" and Robert Hesketh's "Devon's Geology". 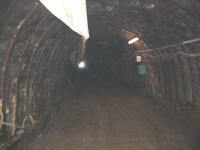 Viewed another way, in the 20 years of Alderley's life, they mined 198,000 tons to produce 3,500 tons of copper. Output in Cornwall and Devon in roughly the same period was 530,000 tons producing 34,000 tons of copper. 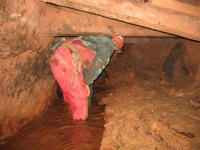 Some of the copper mines are still accessible above adit such as Devon Great Consols. At Morwellham, the industrial museum sited on the Tamar, tourists can visit the George and Charlotte mine by train (see pictures below). Railway to George and Charlotte Mine and a battery loco in the entrance. Water wheel inside the George and Charlotte Mine and a mineralised shaft with miners' ladder in the main hauling shaft, near the entrance. As described above, tin and copper are often found close together. Given that copper plus tin makes bronze, it is perhaps surprising that no evidence has turned up yet for Bronze Age mining in the south-west. 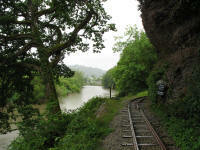 Mines such as Devon Great Consols were worked for tin, often before they became famous for their copper output. Other tin deposits, including some of the earliest, were worked by tin streaming - collecting the denser cassiterite tin ore from streams and rivers where it tends to settle out on bends. Tin streaming continued as a way of reprocessing waste from the mine sites. Of course, tin is best known in Cornwall for the impact made on the local population when tin mines closed in the last century although economic fluctuations have long been an issue with mining. Tin mines can be visited by tourists and mine explorers at a number of places although, as with copper, much of the mining was below the water table set by a nearby river or the sea. 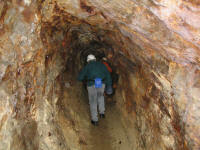 Examples of tourist sites are Poldark Mine, South Crofty and Geevor where underground trips can be undertaken. 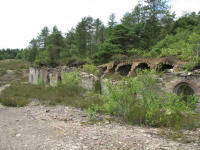 Geevor and South Crofty are particularly interesting sites because they closed within the last decade of the 20th century and therefore much of the recent infrastructure is still intact. Indeed, South Crofty may, may not, may, may not, may ... be reopened some time. Wheal Peevor on North Downs near Scorrier. 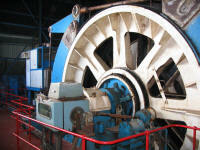 Having three engine houses is not uncommon, one for hauling, one for pumping and one to operate the stamps in the mill. The second picture shows an old shaft waiting to be recapped. New Cook's Kitchen Shaft with its unusual double headframe and the second-hand winding engine on the southern headframe. Although designed to allow use of both halves of the shaft, this was not achieved for safety reasons. Old workings in South Crofty and for comparison a section of the recent decline. Geevor seen from the direction of Levant. The headframe is over Victory Shaft. The mill runs down towards the sea off the left of the picture. 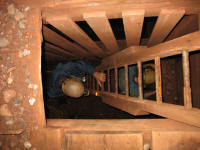 Descending the 300 foot ladderway in Victory Shaft. 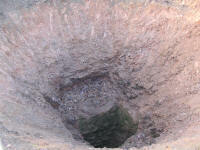 Adit on No 3 Level near Victory Shaft with services and a drainage channel. The right hand picture shows the low roof in parts of the adit. Lead and silver were mined in the outer limits of the mineralised aureoles around the granite masses. 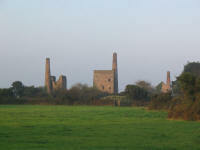 A typical site was East Wheal Rose in Cornwall which is the subject of a book by H L Douch. Lead and silver were also found in areas such as the Bere Ferrers peninsular and at Dolcoath near Redruth. Some of these mines were mined in medieval times and Bere dominated English silver production at one time. Very few mines were actually worked for arsenic and nothing else except in the last phases of Devon and Cornwall mining. Before then, arsenic was normally a by-product, and not a popular one, from the production of copper. In order to extract copper from an ore containing arsenic, a process of calcination was developed where the mixture containing sulphide ores of copper and arsenic was heated in air to about 610oC which drove off the arsenic as the trioxide (As2O3). This was collected in flues as it condenses directly to a solid (sublimation) at less than 170oC. After some refining, a clean white product was obtained, milled and packed in barrels. Arsenic was initially removed at the mine because it was cheaper to calcine the ore and ship purer copper ore to Swansea (the main refining works) but in time specialised works were set up. 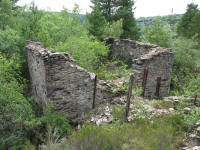 Mines such as Devon Great Consols were originally worked for copper with arsenic as a by-product but, later, were reworked taking the poorer ore left beforehand to produce more arsenic than copper. In the final stages, the old arsenic-rich tips were also reworked. 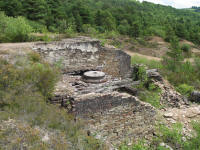 Remains of a Brunton calciner at Devon Great Consols. The hot gases containing arsenic trioxide were channelled to the labyrinth (right) and then to the chimney. 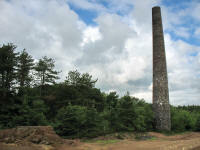 The arsenic was ground to a powder in the mill using the same techniques as for milling flour while the vapours containing sulphur oxides when to the chimney, usually placed on high ground. As mentioned in the introduction, the keen explorer can find iron mines (e.g. near Bovey Tracey), tungsten (e.g. Wheal Frementor in the Tamar Valley), bismuth, uranium and so on. There are even stone mines (Beer in Devon) and of course mining techniques were often used to develop slate and china clay quarries. There are plenty of sites for a visitor who does not want to get dirty such as Morwellham, Levant, the Engine Houses at Pool and so on. 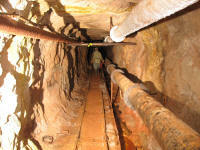 The museums, such as Truro museum also contain exhibits on mining. 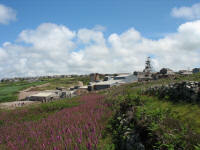 A particularly good site to visit is King Edward Mine which formed part of the Camborne School of Mines and exhibits a variety of dressing techniques as well as a static museum of mining tools, explosives, minerals and mining equipment. Go up (or is it down) one degree, one can visit mine passages at Poldark Mine (called Wheal Roots when it was worked), South Crofty, Geevor and Morwellham. If you want to go down an abandoned mine, but not as a tourist, then the best way is to contact one of the local clubs for advice. They will no what is open, how safe it is and how best to get to it. 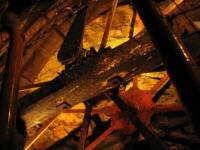 Exhibits at King Edward Mine: explosives in the museum and a working shaking table in the mill. 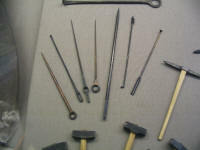 Truro museum: miniature tools and a wellie boot sculpture.